﻿Convenient automatic open/close function for quick opening and closing, high-quality windproof system for maximum frame flexibility in stormy conditions, flexible fibreglass ribs, attractive design thanks to coloured ribs, handle rings and seams, comfortable Soft-Touch handle with integrated push-button and promotional labelling option, convenient case with coloured seams and carrying straps. 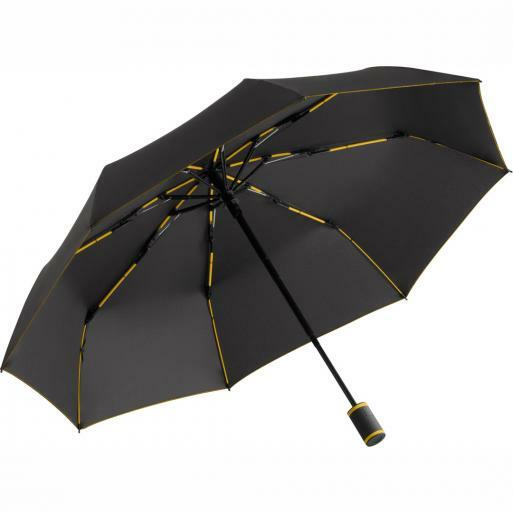 Also available as another mini umbrella (art. 5583) and as midsize umbrella (art. 4783).